Today was Lauren's first day of college and she really enjoyed it! However the part that was hard for her was when her Dad left today. I am so grateful that Jeff was able to go with her and get her all settled in for her semester of college, what an incredible Dad he is. I think that is a large part of why our kids are so happy. Doesn't every person want a great relationship with their Dad, especially a girl? So today was what they call Sweet Sorrow, Jeff said that he was so happy to see how well Lauren seemed to be adjusting yet, he had a hard time saying good bye to her and realizing that his little girl has grown up. It just seems like yesterday that we used to worry about her, what a tough toddler she was! :) I really need to write a book about her and all the trouble and mischief she got into. She was quite the character, actually Angie my granddaughter is a lot like her now but with red hair! :) Watch out Amy and John! When Lauren was little she used to come up with every reason in the world at night not to go to sleep. She would creep down the stairs, when Jeff would ask her why she wasn't in bed here were some of her excuses.
" I am just too tired to sleep", "Daddy, I already waked up", "I am hungry again", "Brad is making too much noise" and the best was ..."Because my belly hurts, why does it hurt?" "Me finks me read too many books!" So tonight I hope my Lauren is able to get to sleep and realizes that her dad is only a phone call away and that her Heavenly Father is only a prayer away. 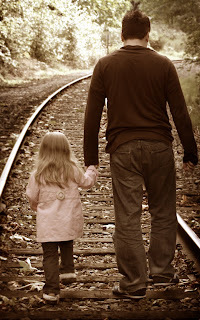 I hope all of you that have a Dads that you are close to, one that is truly your protector, your example and your friend, that you will tell him that you love him... and be grateful for that wonderful blessings in life. Good night dear friends!